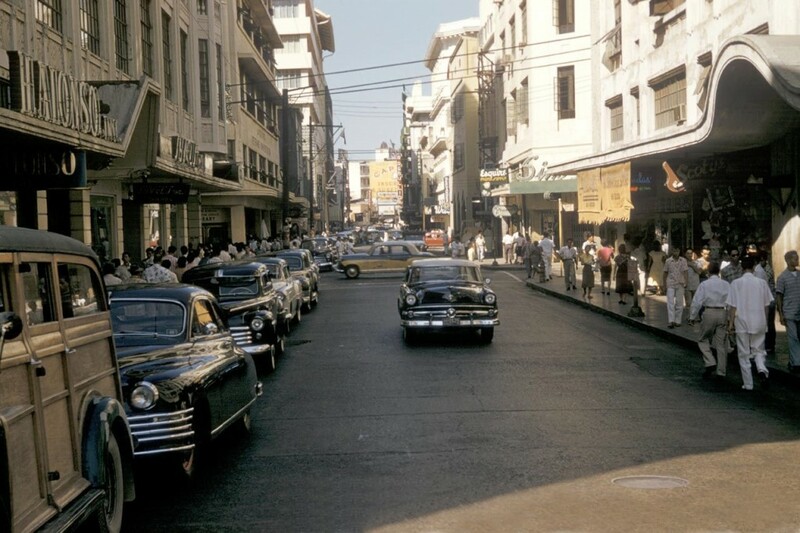 Escolta in the Fifties. I keep remembering those times. Was it a magical era or was it because I was a kid and perhaps everything held a sense of wonder for me ? I went to school from 7:30am to 12:30pm and being an only child of two working parents, I found that I would entertain myself by wandering down the Escolta, Dasmariñas, Sta. Cruz and surrounding areas, killing time until our store, the Gem Gift Shop, closed up for the evening. That was a lot of time for a kid to spend by himself but then again, there were a lot of things to see and a lot of adventures to be had. I recall wandering down by the Pasig River by the Muelle de la Industria and seeing some of the boats and sometimes a ship or two, cruising their way west towards the bay. Most of the time was spent in the many department or specialty stores that abounded in that area. One of my favorite stores was Berg’s. It featured everything a modern department store should have…including toys ! It was only recently that I made the acquaintance of the owner’s daughter, Evelyn Berg Empie. Evelyn is herself an author of her autobiography, “A Child in the Midst of Battle: One Family’s Struggle for Survival in War-Torn Manila”, 2001 (available on Amazon.com). In addition, I was also lucky to find the family of the later owner of Berg’s – the Sylianteng family. Both were so generous in providing me history and photographs which I’ve included here. 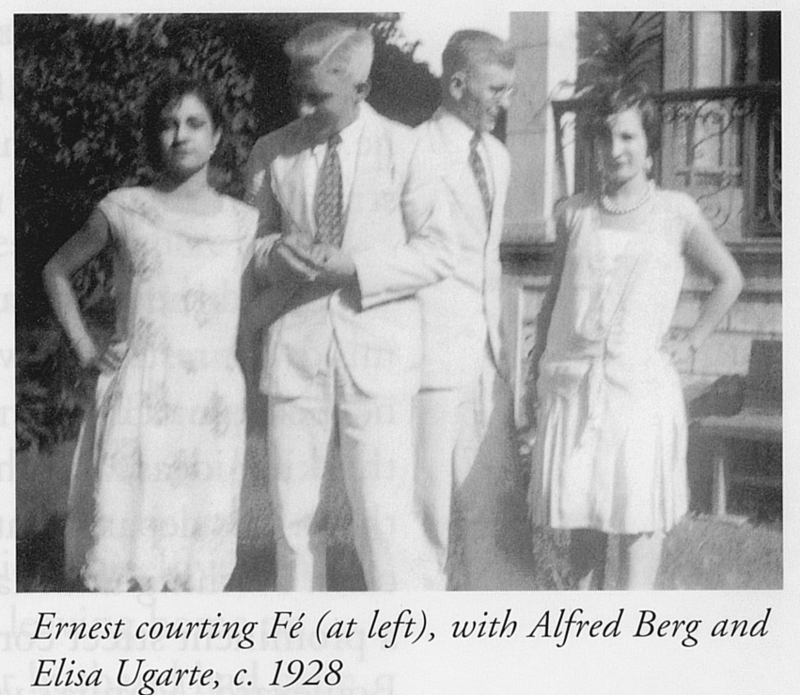 Ernest Berg stood out among the local crowd. Although average height, he had blond hair and blue eyes and soon acquired a deep tropical tan. 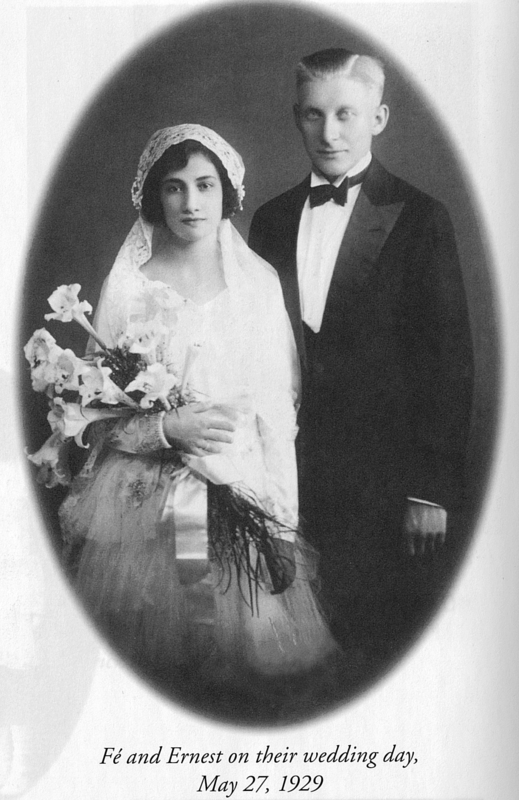 His confidence and bearing attracted a lovely Spanish / American mestiza by the name of Fe Mandelbaum. They married in 1928, he was 28 and she was 19. Quite the entrepreneur, Berg started his first business, the Red Star Auto Stores which quickly grew to a chain of 32 branches that spread throughout the Philippines. 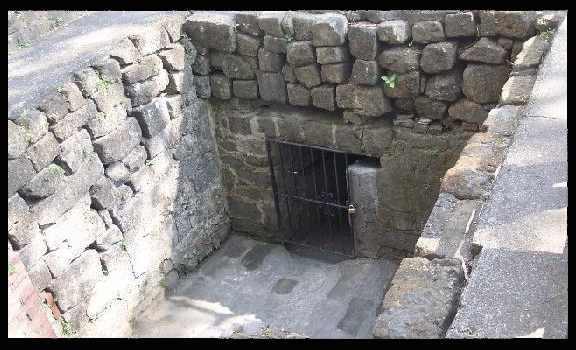 Below, steps leading to one of the dungeons in Ft. Santiago where many unfortunate souls were interrogated, tortured, imprisoned or murdered. 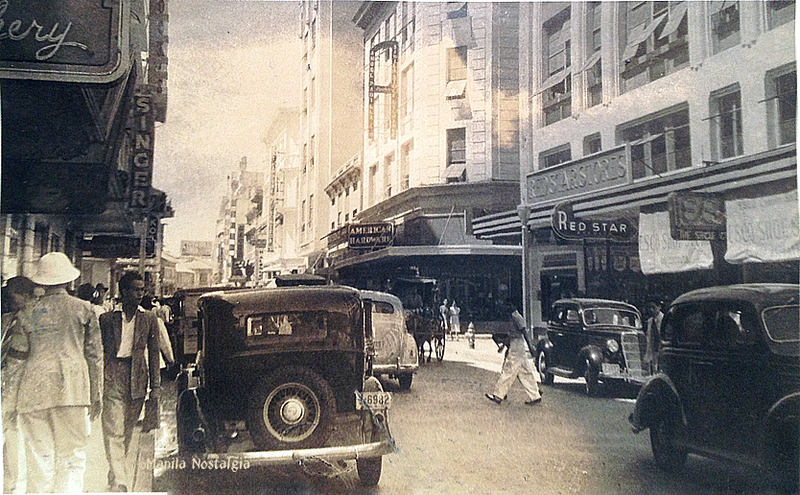 But by the mid-1930s, the Escolta had grown from its humble beginnings to the premier shopping district in Manila. It was filled with offices of professionals: dentists, lawyers, optometrists and of course retail stores such as I. Beck’s, Heacock’s, Riu Hermanos, and Estrella del Norte. And within the newly built Crystal Arcade, the Manila Stock Exchange, more offices and retail shops. Business was booming and Ernest Berg wanted to ride along on that wave. The Lyric Music House in the Perez-Samanillo building vacated, leaving that attractive corner location of Escolta and Calle David available. Quick to realize the retail potential, Ernest and Alfred opened a new department store called Berg’s. 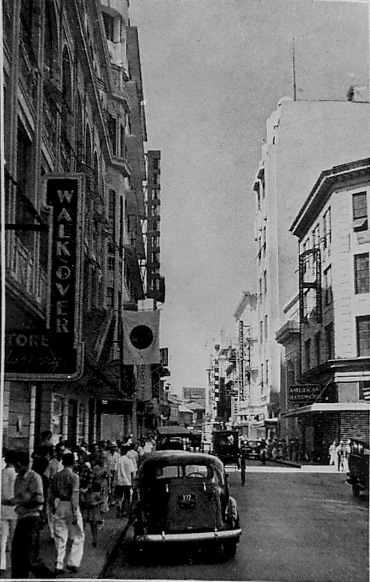 The Perez-Samanillo building is partially hidden on the right where the Lyric sign is displayed (see below). The fears of Japanese aggression and impending war were realized when Japan attacked the Philippines on December 8th, 1941. Being a German citizen, Berg was allowed to continue his business while Evelyn’s maternal grandfather “Cheri” Mandelbaum, an American architect and draftsman who worked with Architect William Parsons, was interned with other Allied civilians at the Santo Tomas Internment Camp. The Battle of Manila wreaked destruction on what was once “The Pearl of the Orient”. 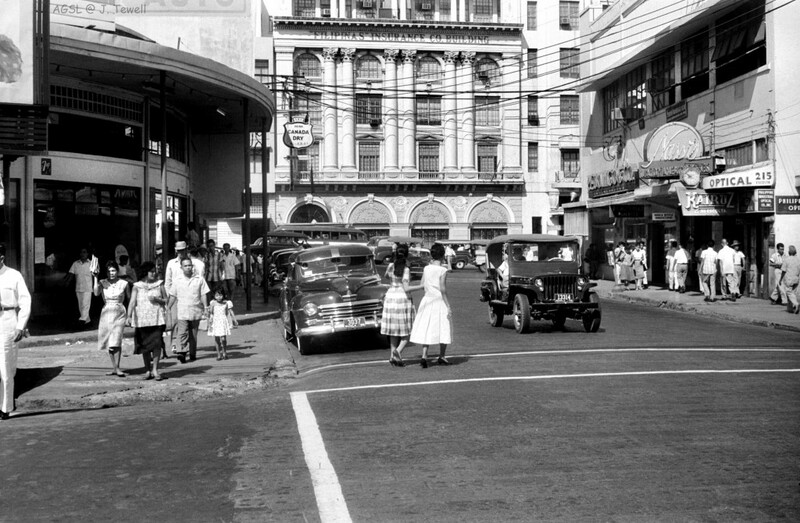 The beautiful Escolta with its fine stores and buildings were almost totally destroyed, the Crystal Arcade laid to ruin. The photo above clearly shows the Perez-Samanillo building on the right now a burnt-out shell. The years of reconstruction were hard on everyone, especially those trying to restart their businesses. After a few years, Ernest called it quits and found another entrepreneur to carry on the Berg’s tradition, Mr. Sy Lian Teng. Sy Lian Teng was born in 1906 in Amoy, China. At the age of 13, Sy was summoned by his father to join him in Manila to help in his sari-sari store business. After a few years, both eager and ambitious, Sy went on to work for the owner of Cosmos Bazar, founded in 1926 by a Mr. Lim. Sy’s sense of customer service impressed Mr. Lim so much that he offered Sy half ownership in the store and later, Sy bought out the business when the owner retired. The young Mr. Sy’s career in retailing blossomed. In 1930, at the age of 24, Sy married Lee Siok Keng and they had nine children. Sy continued his import business during the Japanese occupation but eventually closed the store. 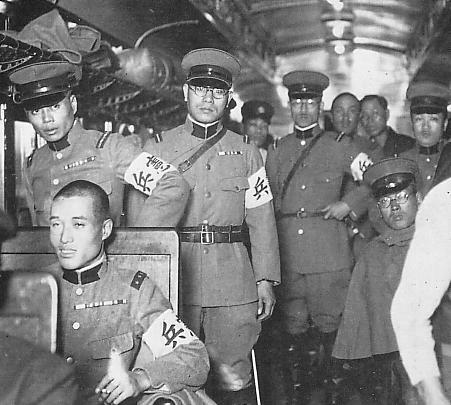 In 1945, Sy’s brother, Hua San was captured by the Japanese and never returned. Fearing additional reprisal from the Japanese, Sy was advised to leave Manila with his oldest son, Guillermo. Tragedy took its toll as the remaining members of Sy’s family, his wife and eight children, perished in a fire during the Battle of Manila. The unfortunate Mr. Sy not only lost his home, his store but also his entire family. He left Manila for his childhood home in China to take a break and somehow re-energize himself. He was introduced to the Methodist religion and was quite devout and active in church affairs throughout his remaining years. Sy returned to Manila and with the help of many friends, he began to rebuild his life and the Cosmos Bazar. He fell in love with his bookkeeper, who had been a dear friend to his wife and family. Sy and Emerenciana Antonio Soyangco married in 1949 and had four children. 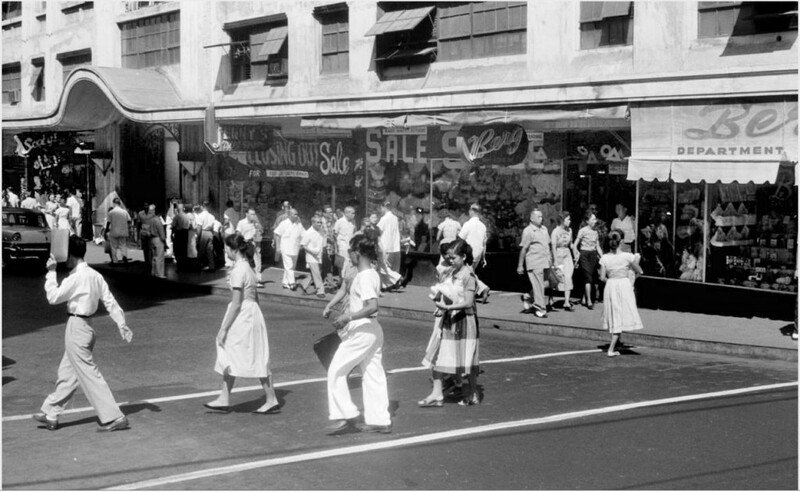 In 1951, Sy bought the Berg Department Store from Ernest Berg. The Fifties and Sixties would see the Escolta district come back to life although not with its former sparkle and renown. Still, Sy enjoyed the glory days of Berg’s. The Fifties were years of building. The Philippines were newly independent. 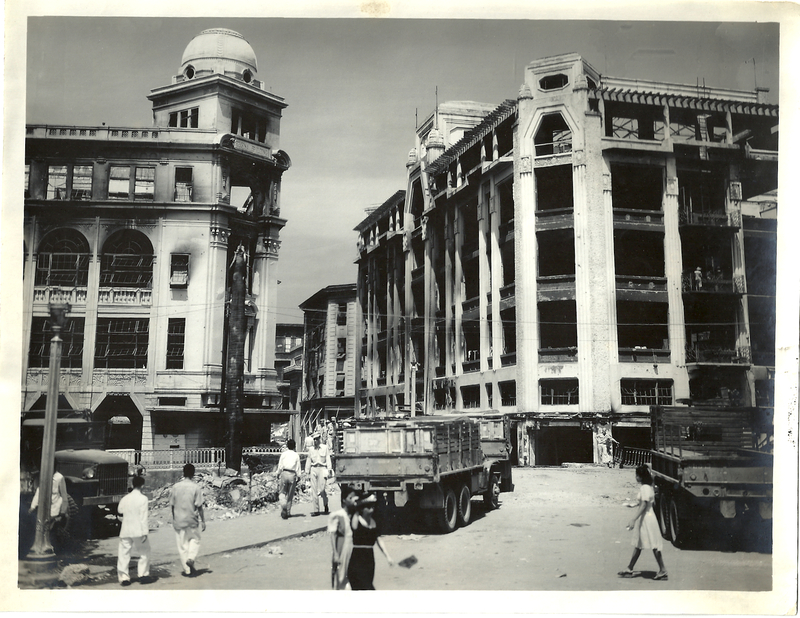 The infrastructure from the Thirties was gone – many of the powerhouse politicians and businessmen had either been killed, passed on from old age or repatriated back to their former countries. But Manila struggled to keep up with the modern times. The rising middle class was now able to afford imported goods. Anything U.S. made was valued although Filipino goods were starting to be produced that would eventually compete with stateside products. Below – photos of Sy Lian Teng at Berg’s. (L-R) unknown, Mr. Sy, unknown, Paquito Pellicer, Doña Rosario Pellicer, and Juan Pellicer. In 1979, upon hearing that the First United Building (formerly Perez Samanillo Building) was up for sale, Sy decided to make a bid for it because he didn’t want new landlords raising his rent spuriously. He bought half of the Ground Floor (where Berg’s was located), the 3rd, 4th and 5th floors from the family of Cory Cojuangco Aquino. He was known for treating his employees fairly and like family although Sy later struggled with labor problems and in January 1982, Sy decided to close Berg’s. He still maintained his office in the First United Building and rented out the Ground Floor space. Sy’s wife, Emerenciana passed away in 2002. Sy passed away in 2004 at the Chinese age of 100. They are both survived by their children Guillermo, Clarita, Gloria, Roberto and Caesar. 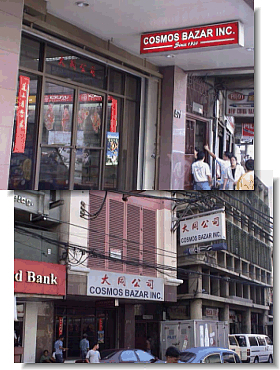 The Cosmos Bazar is still under operations, located at 571 Quintin Paredes. Lorraine and Roberto Sylianteng have been quite active in many projects to revitalize the Escolta district. Lorraine Sylianteng provided me with this great story proving once again that somehow we are all connected via “six degrees of separation”. My thanks again to Evelyn Berg Empie and Roberto and Lorraine Sylianteng for their invaluable help in sharing their history and photos ! Wow ! Another bombshell of memorabilia. I used to wonder thru the same area in the mid to late 50’s and yes it was a magical area and ERA ! On my last trip to Manila we took the Pasig river ferry and landed at the Escolta landing. What a disappointment. The place was run down, and nothing left of the old magical place that I remember. Very informative again, Lou! Two Thumbs up! And thanks to you too for the great work you do on your Facebook site ! I love it. I remember Bergs in Escolta. Escolta St. then was quite a place to go shopping. My father’s law office was in one of the buildings in Escolta. My brother and I used to walk about before meeting my Father and Mother in his office and then proceeded to one of the restaurants nearby. I also remember the photographers talking pictures of the passersby and handing a slip of paper to collect their pictures – and I remember the sweepstakes vendors as well. As they say Lou, thanks for the memories. I guess you’ve gone through many of the prominent Escolta businesses. Too bad we’ve don’t seem to have much info or pics on the smaller shops like MY San Cafe, LR Villar Records, Erlanger & Galinger, Squires Bingham or Cadwallader Brothers on Plaza Santa Cruz. Maybe it’s time to do the Manila Hotel – a very rich trove of pics and memories are available. I recall you said you would do it later when we did the Ermita series because it deserved a file of its own. First envisioned by city planner Daniel Burnham, the Manila Hotel originally was built to accommodate the pax from passenger liners which docked at Pier Seven, touted as “The Longest Pier in the World.” Bellboys trundled their luggage in the short walk from the pier to the plush hotel. And when those passengers boarded the ships for the return voyage, the Philippine Constabulary Band serenaded them with aloha music. (This was the same band that provided free concerts at the bandstand on the Luneta on Sundays.) Paper streamers provided the last contact from departing visitors with their tearful relatives and friends on shore. In those days, any visit to the Orient required a “must do” stopover at Manila, the Pearl of the Orient Seas. Among the personalities that stayed at the hotel was General Douglas MacArthur and his family. Invited by President Quezon in 1935 to be military advisor to the government, his salary package included free accommodation at the hotel. MacArthur at first wanted to reside at Malacanang Palace but when told this wasn’t legally possible, he was given a three bedroom penthouse atop the Manila Hotel. This included food of course. His favorite dish was called “El Mero Envolvio en Hojas de Platano,” which simply was steamed lapu-lapu wrapped in banana leaves with calamansi sauce. The general’s expenses at the hotel were so great that President Quezon was consulted. He decided that to justify the costs, the General would be given the honorary title of General Manager. MacArthur, however, ignored the figurehead status and took control of the hotel management. During the battle to retake Manila, the American troops attacking the Japanese entrenched in the Manila Hotel were surprised to see General MacArthur on the frontline of Ermita. In his memoir, the General said, ”I was anxious to rescue as much as I could of my home atop the Manila Hotel.” Another account relates that the General climbed up the stairs to the penthouse with “a .45 caliber pistol in hand.” A picture however shows him entering the penthouse unarmed. Ironically, this was the same feeling of thousands of Manilans who had also lost their homes in the brutal devastation of Manila. L.R Villar Records was not a small shop during its heydays in the 50’s thru mid-70’s. It was not only a record store but the main wholesale operation of its recording business. The second floor of that original store served as one of its offices for the wholesale operation and located at the back of the store was a door (hidden from the general public) leading to its large recording studio, certainly one of the biggest recording studio during the 60’s. The original space was probably decreased in size during the 80’s when it was winding down its operation due to family decision and obviously from competition. since the social media boom unearthed tons of nostalgic photos of yesteryear’s, it’s refreshing to see them again and a whole new generation starting to really appreciate what it’s like living in those golden age, well at least through pictures and stories like yours. i thought i was the one writing the article up to the point wherein i wandered about escolta while waiting for my parents after school at de la salle taft. my parents worked at bpi in cervantes branch and my mom at pacific bank along rosario st. so i waited at berg’s most of the time since my mom’s sister nita abad (deceased) looked after me there. but when you started talking about the rich and deeper history of berg’s, that’s when i knew, the limit of my story ended at the second floor toy department which i was so lucky to be allowed to play around there – nita abad was an employee at berg’s for a long time in the second floor admin offices of berg’s! now talk about the six degrees of separation. while i was reading the articlefurther, you mentioned cosmos bazar (plus a picture)… that really gave me goosebumps since my mom’s other sister lily abad-isla is STILL working at cosmos bazar! i just wanted to share my little bit of escolta/binondo story since it’s so uncanny that our stories had parallels to it. thank you for posting. i wish there was a book that collected these stories along with pictures so the younger generation will not miss out on beautiful things like these. Thank you for sharing your story as well. It intrigues me that perhaps we might have run into each other at Berg’s at their toy dept. at so some time. Down towards the Capitol Theater was a small magazine shop where I used to spend a lot of time reading their comic selection, which probably irritated the owner I’m sure. Classics Illustrated was one of my favorites. One afternoon, the time got away from me and my mom was frantic thinking I had gotten lost or worse, kidnapped. When she finally found me, she led me back to the store, dragging me back by my arm. I received a sound thrashing that afternoon. Haven’t read a Classics Illustrated since. Thanks you very much Sir. Very informative. I added your blog to my bookmarks. Cheers to you sir! Interestingly, I was never much interested in history as a student. It was only when I started to piece the history together with places I’ve seen or heard about that got me going. I’m glad you like my website and thanks for writing. I wandered the same streets in the mid 60’s to mid 70’s. My dad bought Esquire Barbershop on David St. at around the same time. There were film studio’s in the same building so our barbers ended up as extras on film. 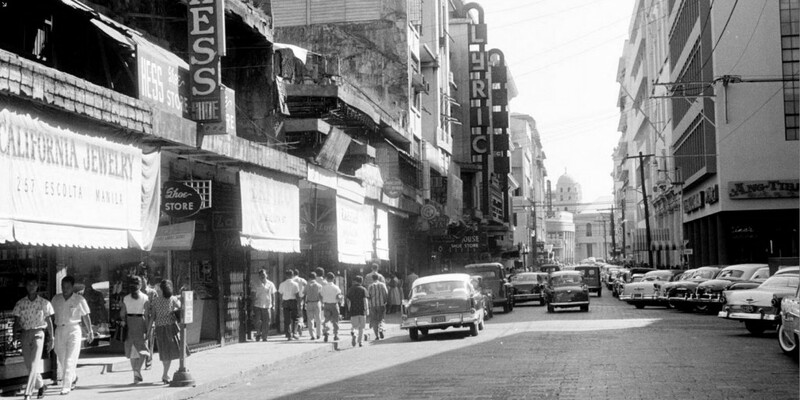 When DBP and PNB moved to Makati, the decline of Escolta started as the rest of the banks followed suit. My dad had to sell as his clientele, the bankers, relocated. I wasn’t born yet when my mom worked for Mr. Sy at Berg’s Department Store. I remember her talking endlessly about her experiences working there and how gracious Mr. Sy and his family were to their employees. I was actually just checking whether there are other people who actually remembered Berg’s as much as she did, when I chanced upon your article. The pictures you included, have put a building and a face behind the stories i’ve heard as a child, thank you. I remember Mr. Sy Lian Teng and his wife were among the generous members of Central United Methodist Church at TM Kalaw, Manila (the first Protestant church in the Philippines). From childhood, I can still remember Mr Sy participating actively as one of the “Three Kings” during Christmas Pageant (Dec. 24) at Central United Methodist Church together with my father, David C. Borje (columnist and political adviser) and Macario Ramos (first Grand Master of the Supreme Council of Order of DeMolay in the Philippines) . Whenever the hymn, We Three Kings is being played, the three will march along the aisles towards baby Jesus, Mary and Joseph, near the altar. They will remain standing beside the manger until the end of the pageant. They continued portraying the character for many years until their death. My father died 2006 two years later after the death of Mr Sy. while Mr. Ramos died earlier in 1995. I know there are many stories to tell about Mr Sy Lian Teng from the members of his home church, Central United Methodist Church. He was one of the most unforgettable figures of the church, since its a historical church. Lou, I loved the beautiful story of the Berg’s department store and the photos (talk about Classics Illustrated)! My dad used to work at the FGU building during the early ’50s and we would be picked up at DLS Taft after 3:15 dismissal and swing by to pick him up before going home. We sometimes would kill time and go with my mom to shop at the Escolta stores. On my unlucky days I would be a reluctant patient of Dr. Conception, a white-haired dentist, on the 3rd floor of one of the Escolta buildings next to Berg’s. Thanks again for the memories! 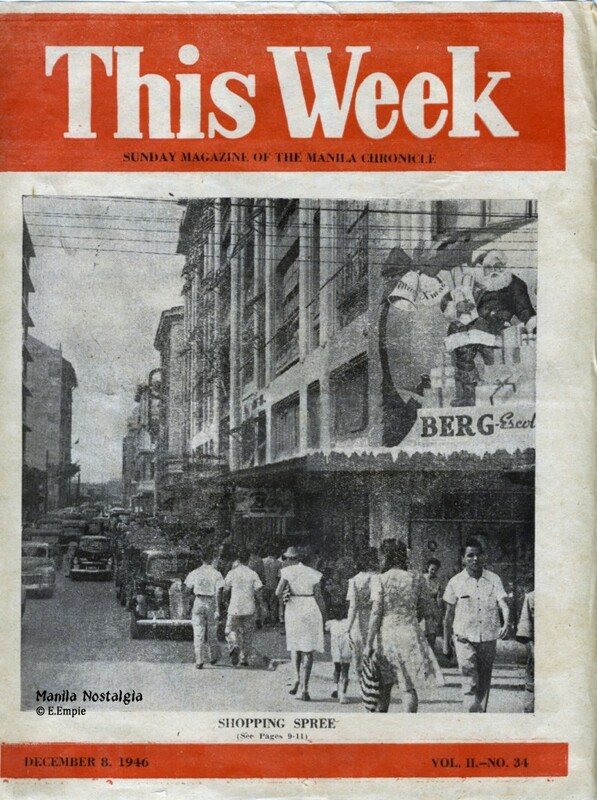 In the 50s, my father had a law office near Escolta. If Samanillo bldg. had a circular lobby open to all the floors, then that’s it!